Travel with a smart phone or tablet and you should also travel with some kind of backup power. It frees you up from permanently hunting for recharge stations in airports and plugs in cafes, but very few mobile battery packs are worth having. It’s all about mAh – the milliampere hour – and the IOGEAR 12,000mAh is chock full of ’em. With inflight Wi-Fi now kicking-in, this is about to become hot property. Trouble is, the sweet spot for manufacturing batteries for smart phones is towards the tiny and pointless end of the spectrum. The upshot is that almost every single smartphone battery you’ve ever seen advertised for sale in a shop will give you perhaps a couple of hours extra charge. Seriously, they’re not worth the bother. 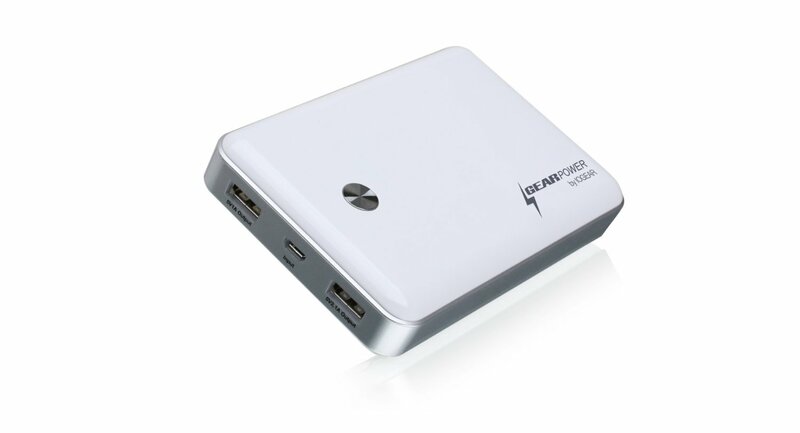 The IOGEAR 12,000mAh Mobile Power Station, however, can keep you going for days and even weeks on end. Perfect for anyone who doesn’t want to have to think about charging their gadgets whether they’re heading off into the wild or on long bus, plane or train journeys, the IOGEAR 12,000mAh Mobile Power Station isn’t exactly small. But while most uber batteries are big and heavy, the 8x12x3cm, 273g bulk of the IOGEAR 12,000mAh Mobile Power Station is digestable. It’s about the size of a couple of smartphones piled on top of each other. Too much for you? In that case, forget about the mobile batteries completely for a decade – batteries like this will be smaller. Charging-up by micro USB, the IOGEAR 12,000mAh Mobile Power Station has a 5-volt 1-amp USB output and a 5-volt 2.1-amp, which can charge a phone/ereader and a tablet, respectively – and simultaneously. Remember that the mere process of outputting power to a tablet often takes-up most of the power stored in mobile batteries. It’s a bit like a plane using half of its fuel just to carry the extra weight of its fuel. Hence this big boy battery. In our tests it recharged an iPhone 5S five times over during an entire week away from power, with enough left over to top-up a Kindle Paperwhite.